Celebrate a wedding anniversary or Valentine's Day by cooking a meal or dessert with your spouse. Spend quality time together in the kitchen while preparing a delicious and romantic breakfast, lunch or dinner. When cooking for two, be sure to incorporate sensual flavors, such as chocolate, into the recipes. Make decadent chocolate-covered strawberries together. Create an easy and romantic Italian dinner for two in a matter of minutes. Enjoy the meal by candlelight as a special touch. Make creamy fettuccine alfredo using chicken or shrimp, depending on your flavor preferences. Sauté the chicken or shrimp in olive oil. Pour a bottle of plain or sun-dried tomato alfredo sauce over the cooked meat and add seasonings, such as salt, pepper and oregano, to taste. Stir in steamed broccoli or mushrooms, and pour the sauce over al dente fettuccine. Serve the meal with a green salad and homemade garlic bread. Making chocolate-covered strawberries with your loved one is a nice way to end a meal. You also can create the sweet treats as a romantic midday or late-night snack. To make the goodies, melt 1 1/2 cups of milk, dark or white chocolate chips and 1 tbsp. of shortening in a microwave until the mixture is smooth and melted evenly. Wash several large, juicy strawberries and pat them dry. Take turns dipping the strawberries into the melted chocolate and place them on a wax paper-covered baking tray. 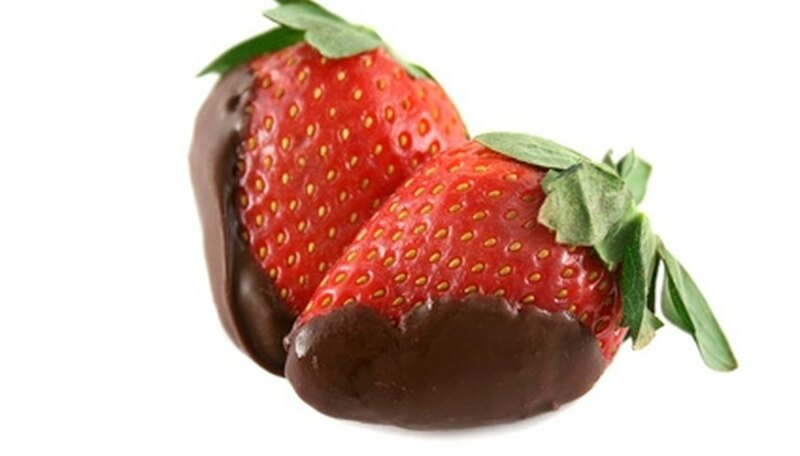 Store the strawberries in a refrigerator for one hour to allow the chocolate to harden. Make a wholesome and tasty breakfast together on the morning of your anniversary or Valentine's Day. Eat the homemade breakfast in bed as a way to spend more time together. Create all of your favorite breakfast goodies, such as French toast, pancakes and crepes on a griddle. If you're in the mood for something savory, make a spinach, cheese or sausage quiche by pouring the egg mixture over an unbaked deep-dish pie crust. Make smoked salmon eggs benedict topped with smooth hollandaise sauce as another gourmet breakfast option. If you're craving a light snack before a romantic night on the town with your significant other, whip up elegant appetizers to hold you over. Prepare snacks you can eat with your fingers and take turns sampling the treats. Make grilled shrimp skewers using jumbo prawns and pineapple chunks. Crispy bruschetta topped with sun-dried tomato and a drizzle of olive oil makes an easy-to-eat treat. Create a healthy appetizer tray filled with gourmet cheese cubes and fresh fruits, such as grapes and apple wedges. Arnold, Elizabeth. "Romantic Cooking Ideas." Dating Tips - Match.com, https://datingtips.match.com/romantic-cooking-ideas-7873233.html. Accessed 18 April 2019.